I just released my 7th wordpress plugin, Image Meta. This one has to do with image handling. Before wordpress 3.0, when you uploaded an image, the filename of the image was set as the title, and if you had given the image a caption (e.g. with Picasa), then the IPTC caption would be used as the caption for the image. 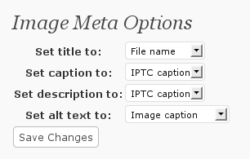 In wordpress 3.0, the default is now to use the caption for the title of the image. I don’t like this, mostly because I had set up my theme’s image handling based on the old way. So I decided to write a little plugin which hooks into the image uploading process, and sets all four image fields at once – the title, alt text, caption, and description. The plugin allows you to select between setting each field to either the filename, the IPTC caption, or leaving it blank. I hope some others find it useful. This entry was posted in photography, wordpress. Bookmark the permalink. I had the same error message when i clicked on the activate now link immediately after the installation process. but I then went to the settings tab and successfully clicked on Image Meta! Everything seem to be fine after that!